Where, exactly, does the line between normal and eccentric lie? Can we even define normality without reference to those who transgress its socially constructed borders? Do eccentrics play useful social roles? 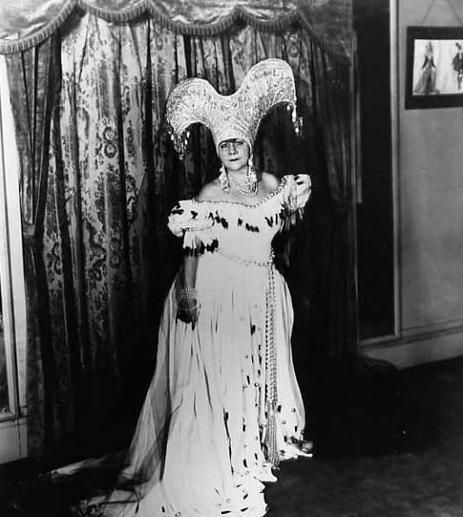 Madame Antoinette Sherri (1878?-1962) spent much of her life defying convention. Although history is replete with personal transformations, Madame Sherri deserves a chapter of her own. Her process began in Belle Époque Paris, where reinvention was in the air, but she refined her skill in Northern New England where it was not. Sherri traveled a circuitous route to become a "New England" eccentric, a path that includes her various surnames. She was born Antoinette Bramare in Paris – officially in 1878, though she was probably older. She acquired seamstress skills, quickly dumped the name Bramare, and reemerged as a Parisian dance hall performer known as Antonia Di Lilas. It would not be the last time she donned a new skin. Antoinette was neither beautiful nor particularly talented, but she possessed magnetic charm even as a teen; among the early friendships she forged was with impresario Florenz Ziegfeld Jr., whose father sent him to Europe in 1893 in search of musical talent. Years later, Ziegfeld would solicit Antoinette's original talent — as a seamstress. Her next conquest was more impressive; at least the press was led to imagine so. In 1909, she met and married Andre Riela, who was more than a decade her junior (though they told newspapers it was just seven). Antoinette De Lilas was an invention, but Andre Riela was a fraud. A romantic backstory was concocted that claimed Andre was the son of Italian diplomat Francis Paul Riela, who imagined that his son would follow his path into genteel diplomacy. Instead, Andre was seduced by the stage lights, not to mention Antoinette's wiles. Riela's parents were allegedly scandalized by his marriage to her. Later a tale circulated that Riela once shared a stage with future costume designer Edith Head. That was almost certainly a falsehood given that Head was considerably younger, never appeared on stage, and did not emerge publicly until a year after Riela's death. About the only thing that was true was that "Andre" was talented enough to secure work as an actor and dancer. In truth, Anthony Riela was an American-born conman named Anthony Macaluso, who had fled to Europe to dodge an extortion charge. In 1911, he and Antoinette sailed for New York, where they staged a tearful reconciliation with Riela's parents, the latter allegedly in the United States on a diplomatic posting. Actually, Riela's "parents" were hired actors, but the press found the storybook blessing too irresistible to fact check. A New York World headline proclaimed, "Tears of bride melt young Riela's family." The scam was little more than a crude attempt to cover tracks as Macaluso still faced the extortion charge that sent him to Europe in the first place. Both "Andre" and Antoinette had more reinventions up their tailored sleeves. Riela returned to the stage, but almost ruined his gambit in a harebrained scheme during 1912 by reporting that a servant had robbed his wife of jewels with an estimated value of twelve to thirty thousand dollars. That a pair of vaudevillians could accumulate such luxury items — the 2017 equivalent would be roughly $280,000-$703,000 — seemed so implausible that one of the detectives assigned to the case quickly recognized Macaluso and carted him off to The Tombs. Luckily for him, he made bail after a few days and a shady lawyer managed to have both old and new charges dismissed for lack of evidence. Anthony Macaluso was released and resumed dancing and secured some silent screen acting, both under the name of Andre Riela. Antoinette designed his costumes. In 1916, Antoinette registered a new 42nd Street business: the Millinery Shop of Madame Sherri. (Sometimes the shop bore the name of Andre-Sherri). The name Sherri was probably adapted from an Otto Hauerbach musical comedy titled Madame Sherry, which opened to enthusiastic Broadway audiences in 1901 and enjoyed a long run. The names Riela and De Lilas disappeared and henceforth, Andre and Antoinette were usually referenced as Mr. and Madame Sherri. Andre's stage and screen career was brief; he increasingly shifted his attention to script writing, stage production, and costume design. For the next eight years, the millinery shop thrived. Ziegfeld was among Madame's clients and she and Andre successfully designed several plays. They drew loud praise for the lavish G. M. Anderson production Frivolities of 1920, which toured outside of New York. Credits list Andre as the show's designer, though it was likely Antoinette did most of the work . More significantly, that production convinced vaudeville pianist and actor Charles LeMaire to alter his career path. In 1921, LeMaire abandoned the stage, moved to New York, and made his way to Madame Sherri's shop. His design sketches did not initially impress the Sherris, though they hired him to tend the counter. LeMaire became such a keen student of Antoinette's seamstress work that he was not long destined to be a shopkeeper. When Ziegfeld paid him $1,000 for designing his 1921 Ziegfeld's Midnight Frolic extravaganza, LeMaire moved from clerk to designer, though for a time he was a virtual ward of the Sherris. Antoinette often claimed she and Andre adopted him. Though LeMaire held both in high regard and later became Antoinette's benefactor, the adoption story seems to have been another of Antoinette's embellishments as LeMaire was approaching his twenty-fourth birthday and needed a patron, not surrogate parents. His association with the Sherris certainly benefitted him, though. He designed several more smash shows, most notably Ziegfeld's 1928 The Five O' Clock Girl, but well before then, he was ensconced in Hollywood, where eventually his work garnered twelve Academy Award nominations for costume design. (He won four times.) LeMaire's chief rival was none other than Edith Head, who would win eight Best Costume Design Oscars before her death in 1981. In all likelihood, the story of Head appearing on stage with Andre Riela was cooked up by Madame Sherri to diminish Head and — probably not coincidentally — advance the idea that she was the inspiration behind LeMaire's genius. According to biographer Eric Stanway, we do not know if LeMaire was a willing partner to all of this, but as noted, he did assume the role of Antoinette's benefactor. In 1924, Madame Sherri's life took a tragic turn when Andre went blind, then insane. He died on October 19, 1924, perhaps a Prohibition victim consumed by the effects of poisonous "bathtub gin," but most likely from advanced syphilis. Antoinette designed costumes for several more years, sometimes with LeMaire, but she soon gave up her needle trade, closed her shop, and began spending summers in New Hampshire. A silent movie actor named David John ("Jack") Henderson maintained a summer home in West Chesterfield, an unincorporated village three miles across the Connecticut River from Brattleboro, Vermont. Today, Henderson is a nearly forgotten figure, but he made his mark as a bit player in Charlie Chapin films for both Essanay Studios and Mutual Film and parlayed those roles into other minor parts. In 1931, Henderson acquired the nickname of "Ridin Fool," the title of an obscure Western in which he appeared. Henderson was much better known as bon vivant than as an actor. Away from the gaze of the media, Henderson threw lavish parties that defied both Prohibition laws and the norms of New Hampshire locals. Free flowing booze and naked women emerging from cakes were standard features of Henderson soirees. Madame Sherri began attending Henderson parties in 1924, first to assuage her grief, but eventually to indulge all that was flamboyant in her — which was plenty. In 1929, she purchased the adjoining Alphonse Furlone House and the first seventy of what would become nearly six hundred acres of land in West Chesterfield. Much of the money, apparently, came from LeMaire — still listed in numerous accounts as her adopted son. At some point, Sherri opted to be a big fish in Greater Brattleboro, Vermont area over being a small one in New York. In 1931, she debuted her most outlandish reinvention: Castle Sherri. Stanway dramatically called it a "cross between a Roman villa and a French chalet." The house was impressive, though hardly a castle in the usual understanding of said term. Local contractors were frequently baffled by Sherri's vision – one that seemed to exist more in her changing imagination than on any sort of blueprint – and some were so annoyed by her over-the-shoulder oversight that they quit. Alterations, whims, and soaring costs defied the reality of the 1929 stock market crash as well as ongoing recession. Madame Sherri's "castle" was actually a pitched roof two-and-a-half story house, stone on the bottom and clapboard on the top floor and garret, the latter surrounded by a wrap-around balustrade deck, its most chalet-like feature. Architecturally the most impressive external detail was an outside staircase hewn from ledge rock, the feature that conjured a castle for those with fertile imaginations. The carved stairs also sported three rounded arches facing the front of the house that gave symmetry to ground level rounded windows and oak door. It was, in essence, a mishmash of chalet, French provincial, and a garden cottage with oversized New England eyebrow dormers. It was more than exotic enough in an area filled with farmhouses to appear a "castle," but what took place cemented the Sherri legend. As sociologists have long discussed, innovations, fads, and cultural change often come later to rural areas. The 1920s in Greater Brattleboro — a town of just over 8,000 people when the 1920s opened — would not have looked much like the New York nightlife that inspired the term the "Roaring Twenties," but courtesy of Madame Sherri, some aspects of it would have growled in 1930s' West Chesterfield. Glamorous young men and women were always in attendance at Sherri's frequent soirees, with show business people making the pilgrimage to New Hampshire to attend. No party began until Madame ascended the stairs and took her place in a carved cobra-back chair dubbed the "Queen's Throne." There, Sherri puffed Fatima cigarettes — an exotic brand by New Hampshire standards — and presided resplendent in sequined gowns and wearing outlandish headgear: a feather-plumed headdress, a gravity-defying ram's head crown with jewels hanging from its points, or a makeshift turban fashioned from various bandanas. Madame accented her costumes with strands of pearls and sparkling jewelry, most of it probably stage paste. As in Henderson's parties, the gaiety was alcohol-fueled though Prohibition did not officially end until December of 1933. Few locals ever saw the interior, but tales circulated of its fanciful furnishings: a polar bear rug, numerous gold Buddhas, sixteenth century Italian pottery, brocaded tapestries, fine porcelain, ornate furniture, mirror-lined bathrooms, and a bust of Jackie Coogan. Locals speculated that Madame Sherri financed it by being a literal "madame," that is, by running a prostitution ring. Some even speculated she was in cahoots with notorious mobster Al Capone and that Supreme Court Justice Harlan Stone was among her frequent guests. It is highly doubtful Sherri ever met the Chicago-based Capone. Rumors about Justice Stone are equally dubious. He had been born in Chesterfield, New Hampshire, but his family moved to Massachusetts when he was still a boy. Although Stone was known for occasional prankish humor, as Burt Solomon states, when on the bench the justice sported conservative personal habits. He was appointed to the Supreme Court in 1925 and was an associate justice when Sherri's wild evening were in high gear, all of which makes him an altogether unlikely guest at Castle Sherri. Outlandish improbabilities often attach themselves to eccentrics. If packaged with just enough flair, legends become alternate reality. Madame Sherri's very life became theater. She secured a cream-colored 1927 Packard, had its wheels painted bright red, and hired a series of uniformed chauffeurs — usually a virile younger man — to drive her. Sherri told all that her car was built on commission for the Prince of Wales, who decided he didn't want it. This tale was another fabrication; she actually purchased it directly from Packard Motors for $3,500. But her presentation was convincing. Madame sat regally in the back and chain smoked, while a pet monkey sat perched on her shoulder. She wore a fur coat in all weather, and was often either scantily clad or stark naked beneath that coat. Stories abounded of her scandalous behavior. Madame reveled in being driven to Brattleboro, where she paid for her purchases by pulling money from her bosom or from a purse strapped to a garter on her thigh. She apparently did so slowly, allowing ample time for ogling. Construction workers claimed she enjoyed titillating the workers on her property by wearing just her fur coat. Stanway states that laborer Paul Welcome recalled that she often sat on a rock with "her legs up. When she'd have to go to the john, she just went and it ran down the rock…She had the modesty of a rooster." What few knew is that Castle Sherri was all for show — a party house. Thanks to a quarter mile of copper tubing and wires, the castle had electricity, but the old Furlone farmhouse in which she actually lived lacked power, running water, or a telephone. With her characteristic carelessness, boxes, mementos, clothing, and whatnots were strewn everywhere, and her pantry became a de facto privy from which she simply tossed chamber pot contents out the window. Her hand-to-mouth daily existence was a harbinger of her future. Party attendance at the Castle dwindled as the depression lingered and by the outbreak of World War II, Madame grew too old to play the winsome ingénue. She lived in increasing squalor with her smoke and mirrors fantasies growing unsustainable – especially with Charles ensconced in far-off Hollywood, a decreasing presence in her life both emotionally and financially. She briefly attempted to turn the Castle into a nightclub, but this venture went as sour as an ill-fated investment made in South American gold mines, and an even more harebrained plan to lease her own land to ore prospectors. Nor was she eligible for Social Security, as she did not claim to be old enough when benefits began in 1940, nor had she collected a paycheck since shortly after Charles died. This meant she could not verify she had ever been a wage earner. By the late 1940s, Madame Sherri was indigent and had to rely upon neighbors for food, firewood, necessities, and rides — her Packard sitting idle on her property. Not as much is known of this period of her life, though she apparently became a Jehovah's Witness in 1952. As Stanway reports, locals complained that her personal demeanor turned antisocial, her hoarding grew worse, and she became so demanding that she was described as "like a vulture" in her shameless demands for eggs, milk, and other produce. Sometime around 1957, Sherri announced she was moving back to New York City, still another lie as she was actually staying with friends in Quechee, Vermont. When she next visited Castle Sherri in 1959, she was crestfallen to find it had been burglarized and vandalized. Sherri – by then probably in her 80s – moved into a boarding house in Brattleboro. When she couldn't pay her rent, Brattleboro officials brought suit against her in August of 1961, and attached her goods – which were few and didn't amount to much. She was declared a ward of the town and was committed to a nursing home, where it was said she became senile. On October 20, 1962, a fire consumed Sherri Castle, reducing it to ruin. Her Packard was sold for $7500 at auction in September of 1963, and Furlone House was condemned and eventually torn down. West Chesterfield resident Anne Stokes finalized a sheriff's sale purchase of Sherri's land on October 21, 1965, the very day Madame died in the Brattleboro nursing home. In 1998, Ms. Stokes sold nearly 500 acres to the Society for the Protection of New Hampshire Forests. Today, the land and its trails bear the name of both Sherri and Stokes. The Castle remains are often a backdrop for wedding photos and is also a popular site among ghost hunters, some of whom claim to detect Sherri's presence amidst the ruins. In 1972, Charles LeMaire acknowledged that he had long supported Madame, but he refused to give details or say much more than to ask writers not to believe all the tales they heard about her. But believe them we do. Eccentrics are more pleasant to contemplate, not lonely old people who outlive their times. Victorian novelist Elizabeth Gaskell once observed: "Sometimes one likes foolish people for their folly, better than wise people for their wisdom." We enjoy their follies and eccentricities, but perhaps more is at stake. What of the questions posed at the front of this essay? Society operates according to norms, but these are agreed-upon abstractions that structure rules of social interaction around shifting ideas of goodness, morality, desirability, and acceptable behavior. Not only do these codes vary from culture to culture, they are constantly negotiated and renegotiated within a culture. In 1953, the British novelist L. P. Hartley opened The Go-Between with words that have since become folk wisdom: "The past is a foreign country: they do things differently there." For our purposes, his words serve to remind us that the definition of normality has been (and is) a moving target. Dennis McNally is now best known for having served as the publicist for The Grateful Dead, but he also holds a Ph.D. in American history and is a Jack Kerouac biographer whose original goal was to write the history of American bohemianism. He views the Grateful Dead's Jerry Garcia as "part of a very old path" of American misfits who reshaped American thought, a trail that goes through people such as Henry David Thoreau, Walt Whitman, John Coltrane, the Beat poets, Lenny Bruce, and scores of others. Whether or not one draws the lines as directly as McNally is beside the point; he is essentially correct that people, ideas, and phenomena that were once outliers — following Malcolm Gladwell — are now valued, a list that includes jazz, vaudeville, rock n' roll, film, and television — not to mention once-unorthodox-now-core principles such as sexual and racial equality, spiritual freedom, and gender fluidity. By all reckoning, Madame Antoinette Sherri was an eccentric and would still be considered one today. But the broader point is that when we ask where the border lies between normality and eccentricity, the answer is forever qualified by place, time, and circumstance. Decades ago, Everett Rodgers distilled older studies and developed a schema still used to describe how the embrace of innovation — be it technological or cultural — is a process, not an event, one that begins with "early adopters" and continues until a critical mass adopts it as normative. Even then "laggards" offer fortress-mentality resistance. One must also understand, as sociologists R. H. Turner and Lewis Killian observed, that norms are in constant flux, are volatile, and that neither repercussions nor social change (for good or ill) are immediately obvious. None of this addresses the social utility of an oddball such as Madame Sherri. For this, we take guidance from theorists and researchers who focus more on individuals than collective behavior. Michel Foucault's pathbreaking Madness and Civilization traces the evolution of aberrant behavior from the medieval to the modern era to make several key points. First of all, knowledge and power define how social discourses are constructed, but they too change over time. A second point, more relevant to this study, is that who and what is sometimes labeled "the other" is syntactically significant in that what is normal is generally defined in opposition to what is not. To put it in simpler terms, a norm is only a norm if it can be violated; an A requires a B. In essence, none can be called normal without juxtaposing their behaviors against transgressors who act otherwise. We must finally ask whether those transgressors — call them mad, aberrant, non-conformist, or eccentric — add social value through their violation of norms. The answer is yes. In both a recent publication and in a not-yet completed doctoral dissertation, Brian Comfort argues that, over time, eccentrics redefine normality. His work follows many of the trajectories outlined by McNally, but with a twist. Non-conformity is often unsettling and engenders negative sanctions ranging from mild (scorn, ridicule) to severe (active suppression), but as often as not, non-conformists pose little or no threat to social order; they simply take some time to get used to. To cite just one example, back-to-the-land hippies initially generated great disapproval from Americans hewing to mainstream values. In the end, though some moralists continued to disapprove, most Americans concluded that rural-bound young people growing vegetables and experimenting with collective living were not incendiary revolutionaries. Moreover, as commentators as diverse as historian Timothy Miller, ex-communard Tom Fells, and conservative commentator David Brooks have noted, their efforts led to several long-term positive changes, including organic farming, a restoration of artisanal craft traditions, niche market production, and the DIY and locavore movements. We cannot make such exalted claims for Madame Sherri, but she does fit with Comfort's assertion that eccentrics extend the boundaries of how normality is defined. According to Carl Sifakis, that too is an old path, one in which comedian Sophie Tucker fits into a discourse on body image, Mae West on sexual openness, Sylvester Graham on a healthy diet, Henry Thoreau on environmental awareness, and the campy Liberace on gay rights. Madame Sherri may have had the modesty of a rooster, but she did little harm and brought vibrancy, excitement, and new ideas to rural New Hampshire that challenged locals to stretch their tolerance limits. To return to Hartley, the past is indeed a foreign country; we do not feel at home there because our own norms, values, and horizons have been expanded by hundreds of eccentrics like Madame Sherri that preferred to march to different drummers.